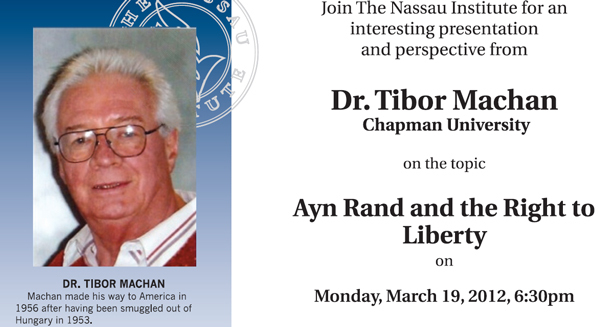 In this lecture, Machan will show that Ayn Rand defends a vital feature of the libertarian, classical liberal political alternative, namely, a conception of human nature that can only flourish in a free society. Machan made his way to America in 1956 after having been smuggled out of Hungary in 1953. With a Doctorate in Philosophy he is Professor Emeritus at the Department of Philosophy, Auburn University, AL, holds the R. C. Hoiles Chair in Free Enterprise and Business Ethics at the Argyros School of Business & Economics, Chapman University, CA, and is a Research Fellow at the Hoover Institution, Stanford University, CA. Machan was visiting professor at the US Military Academy, West Point, 1992-93. He edited Reason magazine for two years and Reason Papers, an annual journal of interdisciplinary normative studies, for its first 25 years. He lectures in Europe, South Africa, New Zealand, the Republic of Georgia, Azerbaijan, and Latin America on business ethics and political philosophy. He has appeared on the late Bill Buckley’s Firing Line, more recently on PBS-TV’s Religion and Ethics in America and Life & Styles, John Stossel’s John Stossel Goes to Washington, and on numerous other media around the globe. C-Span interviewed him on its 3 hour "In Depth" program for authors. His memoir, titled The Man Without a Hobby, was published in 2004. He has authored 40 books, edited 17 more, and written over seventy essays and chapters in other books.